The period from the 2nd March to the 2nd May 2006 has produced some sensational reception from Australia. 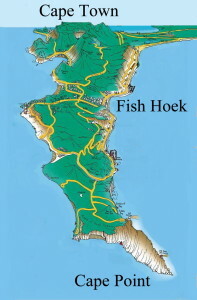 My QTH in Fish Hoek is situated less than 1 km from the False Bay Coast, from which there is an all water path to most of Australia. This would help to explain the awesome strength and clarity of some stations from Western Australia. For example, 6PR Perth on 882 kHz (2kw) has been heard most evenings here with a huge signal! The highlights have included unusual reception of stations from the Northern Territory, Queensland, Victoria, New South Wales and Tasmania. 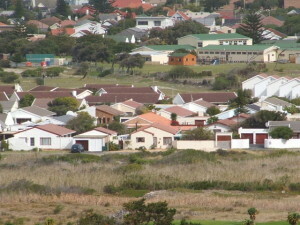 Of the 98 Australian stations received, 28 were heard for the first time here in Fish Hoek. The most notable have included: 2HD Newcastle on 1143 kHz (2kw), 2WG Wagga Wagga on 1152 kHz (2kw), 3ML Mildura on 1467 kHz (2kw), 4TI Thursday Island on 1062 kHz (2kw), 4LG Longreach on 1098 khz (2kw), 4ZR Roma on 1476 kHz (2kw), 7ZR Hobart on 936 kHz (10kw), 8AL Alice Springs on 783 kHz (2kw), 8TAB Darwin on 1242 kHz (2kw), 8GO Nhulumby on 990 kHz with 500 watts and perhaps the most remarkable of all, 5LN Port Lincoln/4HU Hughenden on 1485 kHz with an incredible 200 watts/50 watts respectively. The highlight of the season has been the surprise appearance of KTWG Agana, Guam on 801 kHz (10 kw) for the first time in South Africa at a distance of 14 175 km / 8 809 miles. 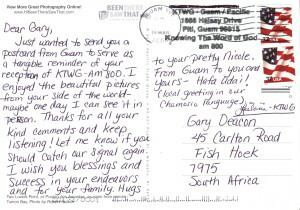 The friendly QSL reply from Operations Manager Leilani Dahilig was a pleasant surprise too! Stations from Western Australia are the most consistent. South Australia and Queensland are heard less frequently. Victoria and New South Wales are not heard that often. The Northern Territory and Tasmania are rarely heard. New Zealand is extremely rare. 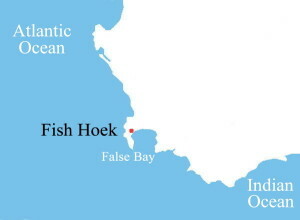 Australian stations at a compass bearing of more than140 degrees from Fish Hoek seem to be the most difficult to hear. For example, 1062 4TI Thursday Island (2kw) at 120 degrees and 12 290 km was more consistent than 936 7ZR Hobart (10 kw) at 145 degrees and 10 007 km. 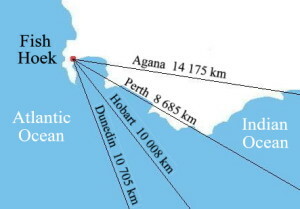 Although a rare catch, I would consider 801 KTWG Agana, Guam (10 kw) at 100 degrees and 14 175 km less illusive than 1044 4ZB Dunedin, New Zealand (10 kw) at 160 degrees and 10 705 km. My conclusion is that polar absorbtion seems to reduce the ability of signals from the more southerly latitudes to reach here. It would appear that quiet ionospheric conditions with very low A/K indices are essential in order to receive dx signals from the south east part of Australia and New Zealand. We've recently been subjected to power supply cuts here in the Western Cape. I decided to take advantage of the situation by dxing from my QTH during the absence of local electrical noise sources. I set up a 160 metre BOG (Beverage on ground) opposite my QTH and directed the antenna at 120 degrees towards Perth. 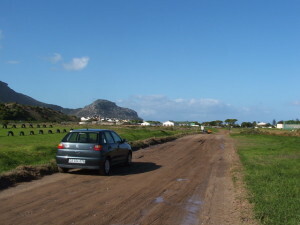 There are no houses along that side of the road for about 200 metres. 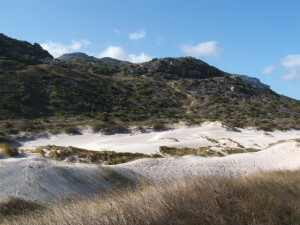 The vacant land forms part of a nature reserve. I parked my car opposite my QTH and listened with the FRG7 which was connected to the car battery via an adaptor. The awesome reception from Australia during the evening was encouraging to say the least! Towards the end of the listening session, the power returned and I was pleasantly surprised by the relatively low levels of electrical QRN across the band. The BOG seemed to have the ablility to null out most of the local electrical interference from directions on the sides of the antenna. 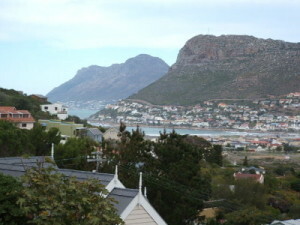 I have also been listening from another quiet location between the Fish Hoek sports complex and Peers Cave, situated approximately 2 km towards the west, where local electrical noise sources are virtually non-existent across the band. 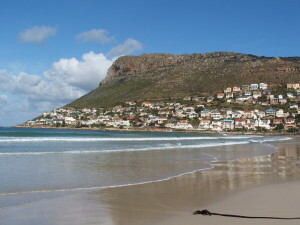 (Peers Cave is a stone age cave site where the remains of the famous 12 000 year old Fish Hoek Man was discovered with a collection of stone age tools). The ALA1530 loop antenna at my QTH also has the ablility to receive Australia with good results. Stations heard on the 3/4 were received with the ALA1530 from home. 4TI Thursday Island 1062 kHz. Full data e-mail verification and coverage map. Really pleased with this verification as this is the most distant of the Australian AM tx's from Cape Town. v/s Jo Lindsay, Communications Officer, ABC Transmission Public Relations. 4LG Longreach 1098 kHz. e-mail verification. v/s Matt Stephens, Station Manager. 4HI Emerald 1143 kHz. e-mail verification stating that I was listening to the Miner's Overnight program. v/s Trent Towsen, Program Director. 4ZR Roma 1476 kHz. Brief e-mail verification v/s Trent Towsen, Program Director. Also received a reply from Kerri Collins, General Manager who stated that she had also received a recent notification of reception and a CD from Japan. "We are pleased to confirm that you indeed heard Australia's Vision Radio Network (then called "Vision FM") on 1431 kHz, emanating from a 500w transmitter in Kalgoorlie, WA; I recollect receiving and reply to a reception report from South Africa over a year ago - perhaps it was yours and the reply went astray in the mail. At the time I was quite surprised that the signal got that far, highlighted now by the clarity of your audio grab ... "
6GS Wagin 1611 kHz. e-mail verification included that they have been receiving quite a few reports lately. v/s Norm Chilcott, Operations Manager. 7ZR Hobart 936 kHz. e-mail and postal verification stating that this is the first report from Africa. v/s Graham Himmelhoch- Mutton, Transmissions Supervisor, Master Control. 8TAB Darwin 1242 kHz. 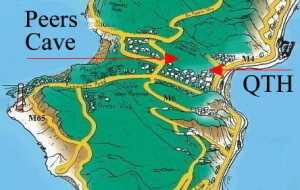 Polite full data e-mail verification included an attachment of a race sheet relating to that evening's coverage of four events from South Africa. v/s Van Richards-Smith, Chief Engineer (VK4ZVZ). Lately I have received several reception reports from Finland, Iceland, and surrounding areas, but you are the first from South Africa! Please send me your mailing address so I can send you a post card. I love the picture of your daughter-she's a beauty! I'm pleased to see that you were able to get quite a bit of understandable audio during your reception of our signal. We are a non profit Christian radio station utilizing a 10000 watt transmitter. Please let me know of future receptions. Blessings to you and yours in South Africa!.. Leilani - KTWG "